published in 2006 by The Waywiser Press. "The Entire Animal tells Michael's story without a word to spare. So vacuum-packed is his world that it occurred to me early that if I started to talk about it, its essence would leak out, in the manner of the aroma of ground coffee or those smoked almonds I used to hanker for on airplanes. Long before the end, though, I stopped thinking about myself. I had no trouble becoming involved in the history of Woodington, Derbyshire, the life cycle of the hornet as thoughtfully observed by a man who has put away far too many beers, and the redolence of his pain." Virginia Allen, The Bloomsbury Review, June 2007. 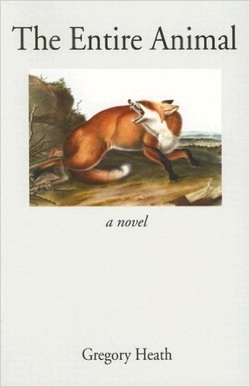 "This is a startling and moving book which depicts how Michael, a dedicated taxidermist, is struggling to make better relationships as he emerges from his stuck emotional life and grief. I cried with sympathy when he tried to express his anger with his father. The observations about hornets building a nest were particularly poignant, as the author makes gentle parallels between them and Michael's workaholic nature.... There is a strong theme of the transformative power of love and the choices people make to try and escape from a trapped life." Tricia Howlett, DET, September 2006. "Michael is a taxidermist in his late thirties. Socially awkward, especially around women, and preferring the company of his stuffed animals, he lives alone in a dormitory town outside Derby ... a man at last coming to terms with the loss of his mother at an impressionable age, and belatedly learning how to let other people into his life and form meaningful relationships with them ... [The Entire Animal] is a ... nicely formed [book], the story progressing in an orderly fashion through a series of discrete, pleasingly realised vignettes – Michael feeling out of place at the attractive younger art student's house party; Michael sharing a joke with his sister-in-law for the very first time; Michael at his dying father's bedside, the right words to say catching in his throat. And, in the background, the thread of a story about the farming town's recent suburbanisation and concomitant dwindling of community, and lots of ... imagery to remind us that we are human animals, but stuffed with memories, emotion and desire."